I immediately liked the concept of the Sigma rear brake light — lightweight (7 grams), easy to install, affordable ($10), a safety feature. Here’s what I think after making a purchase. Installation is not as easy as it looks. I had to back out the Shimano Ultegra adjustment barrel all the way to accommodate the light. They recommend at least 25 mm of exposed brake cable. Be sure to push the light firmly against the brake cable in order for the screw to securely clamp the brake cable. I’d like to see a better fit for the screw against the cable. As it is now, it mashes down on the brake cable. Test to see that the brake light doesn’t get stuck on. That can happen, if it’s not installed properly. You’ll need a 2.5 mm Allen key. The light comes with a CR1025 lithium battery, which should last at least a year or two. It comes in five colors, but I think red and white have the best visibility against the red LED. Now you can see when your ride partner is braking while descending Page Mill Road, or motorists can know when you’re stopping for a light, assuming they’re not looking down while texting. Available now at the Bicycle Outfitter, Los Altos, and other fine bike shops. This entry was posted on August 20, 2015 at 12:11 pm and is filed under Products. You can follow any responses to this entry through the RSS 2.0 feed. You can leave a response, or trackback from your own site. Neat implementation, but it seems to be designed around the false premise that you’d be using the rear brake a lot. On Page Mill, the rear brake is going to get scarce use or (more likely) none at all. I always use both brakes when braking. Not much good if you have a rear rack with a rack trunk bag on it. 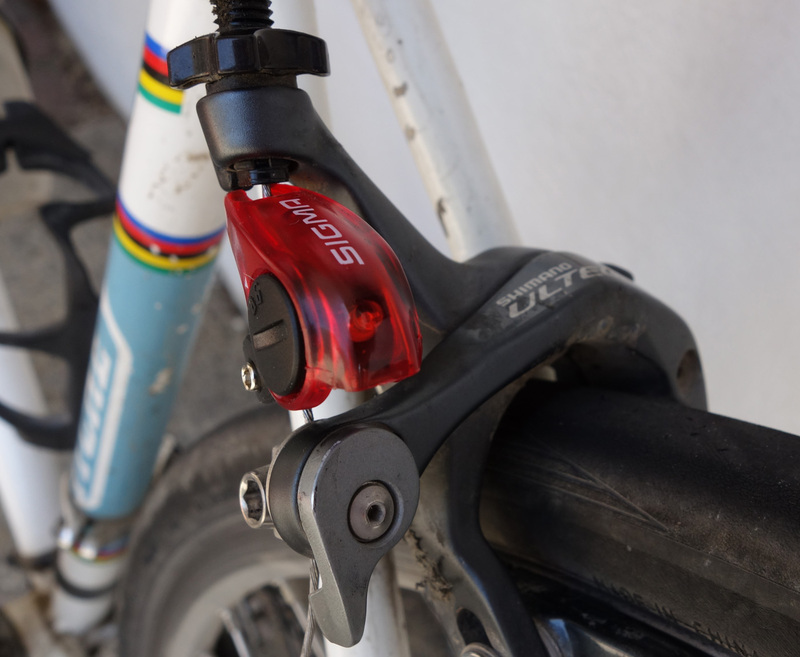 I use both brakes heavily on Page Mill—if not there on what road would you need two brakes? If my brakes are out of adjustment or shoes need resurfacing I’ll know it on PM. The brake light seems like it could be a good idea if you’re riding with others, but as a usually solo rider, I sort of hate adding something like this if there’s no compelling reason. I always ride with a taillight on however. In general, the rear brake contributes nothing to stopping the bicycle quicker–maximum braking is achieved using the front brake alone, at which point the rear contact patch is completely unweighted and any rear brake application will lock the rear wheel. Exceptions are when on slippery surfaces (where the front wheel could actually skid before lifting the rear wheel) and when banked over steeply in a curve (when both wheels are near the traction limit) and of course for riders with weak hands. O. Emry: you’re correct, _maximum_ braking is using the front brake alone. Hopefully, though, nobody has to apply maximum braking while descending Page Mill. Instead, the goal is steady, well-modulated braking, which involves using both front and rear brakes. This is a commonly-held misconception; in general it’s not true for experienced riders. Unless we’re talking about department store bikes, the front brake can be modulated between 0% and 100% of the available stopping power. On dry pavement, the rear brake serves little purpose other than redundancy and decoration. Unless the rider is extraordinarily aerodynamic, Page Mill can be descended without much braking at all. If it’s wet out, or if you’re leaned over near the traction limit (banked about 45 degrees) then you might need the rear brake. Alternately, if you like to descend slowly, you may benefit from using both brakes to avoid overheating the front rim, but even this would be a stretch on Page Mill Road. Could this brake be used on Campagnolo Nuovo Record SP brakes or on center pull brakes like Mafac Racers or Weinmann 750/999s? I’m curious to know if it will work on my vintage bikes….